Margie is a Machine-Assisted Recommendation and Guidance Engine that you configure to meet your practice's needs. She is an intelligent physician office agent that talks to your patients via the web, phone and Alexa®. Eliminate the clinic phone hold music and improve patient satisfaction. The average provider spends 45 minutes entering charges. AlertMD's automated charge capture solution, AutoCode, in its fully automated mode brings this down to zero. This industry-unique workflow saves time for the provider and the health system. AlertMD clients have seen a 7-16% increase in pro fees and 9 days of extra cash on hand. Learn More Hospital systems are growing larger via consolidation as are physician practices. The result is a market of large healthcare delivery networks which compete but also need to collaborate to co-exist. In this reality, health systems need to make it easier for physicians to round at their facilities. They need to create loosely held networks where some employed providers and some independent providers can work as a team. With more volume of care being delivered on an ambulatory basis, the transition from volume to value and managing the disconnects in care become extremely important. The average provider spends countless minutes for manual workflows in risk-based health (i.e., recruiting into a medical home, PCP notifications of visits, full risk patient visit triage, med reconciliation, etc.). Our industry-unique workflow automates every one of these tasks and creates real-time workflows that reduce medical expenses and improves inefficiencies. Learn More AlertMD has been adding value to health systems and providers doing work in the bundled payment reality for several years. Specific to bundled payments, AlertMD can send alerts when a full-risk patient is pending an admission by enabling admit/discharge notifications. Additionally, monitor your follow-up appointments post-discharge and manage communication for pre-op testing all while making procedure check-in easier. All this and more with AutoCoordinate by AlertMD. The average provider spends 15 incremental minutes to request a consult. AlertMD's automated consult solution, AutoConsult, brings this down to zero. Not only does this save time for the provider, but it greatly improves response time from the consultant and increased patient safety from insuring consults are handled. Learn More The process of calling a consult is highly redundant. The provider documents the consult on the chart, the reason for the consult, the background, the follow-up action, and then attempt to find the provider on call. AutoConsult drastically simplifies these redundancies by sourcing information directly from the chart. It knows who called the consult, their callback number, who is servicing the consult, the reason for the consult, the labs/documents for the patient, and more. AlertMD calls the receiving provider for Stat consults with a single push of a button while hiding their caller ID. Our platform works with EHRs to present a single and simplified interface to your providers. AlertMD's fully-integrated pro-fee charge capture solution that automates entry of professional fees. A hands-free mode, called AutoCode by AlertMD, takes the provider out of the loop and enables automatic generation of pro-fees. Understand who among your CBO staff is a hard worker, who is a smart worker, who is a cherry picker and who is a Netflix® watcher. 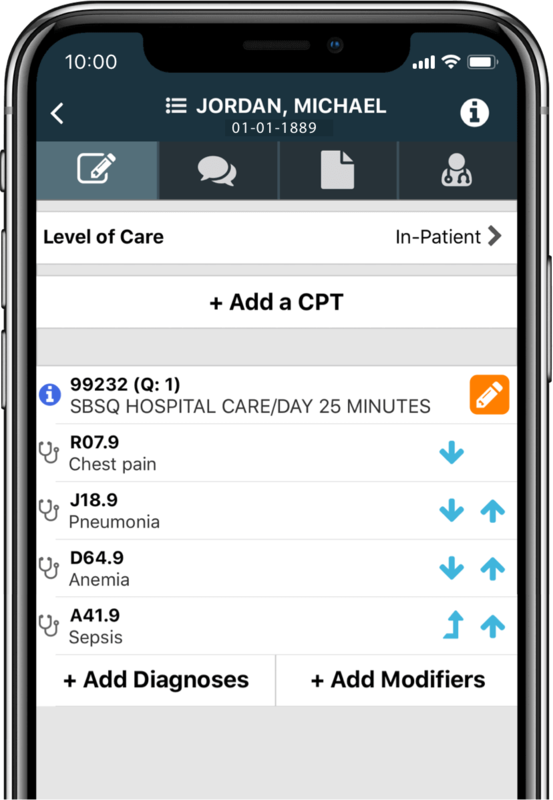 AlertMD delivers critical lab alerts real-time to the providers who ordered them, those who subscribed to the alerts, and those who are copied on the patient's chart. Get alerted when a patient has reached 68% of their GLOS so you can manage their length of stay proactively. AlertMD enables a fully automated provider-to-provider consult workflow that skips manual work while also enabling notifications during business hours for non-urgent consults. Manage your RAF process by understanding documentation that has HCC-identifying codes that are not on your pro fee charges. AlertMD monitors discharge documents and reminds the PCP's office to schedule a follow-up appointment within 'n' days of discharge and notifies the scheduler if an appointment is not scheduled in that period. 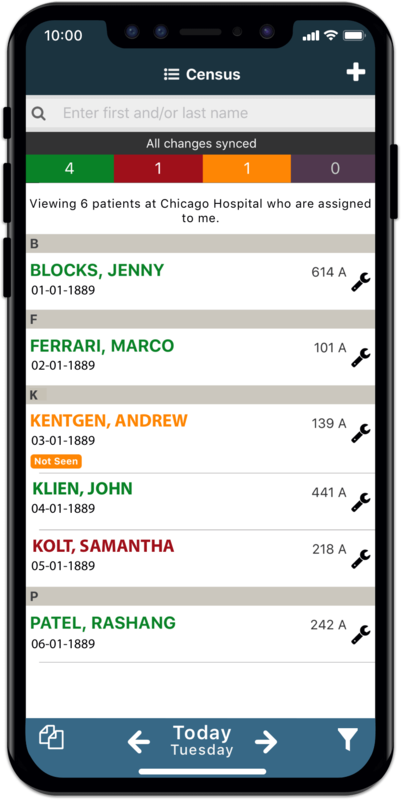 AlertMD delivers EHR documents direct to smartphones and the provider's office real-time. Legacy technology requires the office to check every day to identify if there is work to be done. AlertMD alerts the office automatically. AlertMD enables your providers to manage and maintain their call schedules which in return influences the messaging modules within and outside your EHR. AlertMD delivers notifications to the provider when a patient is admitted or discharged. Multiple levers control when such alert is sent, who gets the alert and more. AlertMD addresses disconnect in physician revenue management workflows, helps align physicians with health system goals, improves nursing efficiency, and makes care coordination far more seamless. Please fill out the quick form and we will be in touch soon!